For those who can't read simplified Chinese, basically the op of that post created a summary of all the latest hacks you can apply to X41 or X41T thinkpads (need to be registered to see the instruction images). 1. LED backlighting (no instructions unfortunately, only a reference to some place in China that can do the ccfl to led conversion). 4. OVERCLOCKING! Apparently, some with the PM 1.5Ghz CPU are able to overclock to 2.0Ghz with just a single wire soldering just underneath the memory expansion slot without even have to open the system! 6. Hacking a Mac power brick to be used with X41T (saves space). Interesting. But you may like to upload the photos somewhere...? Some non-Chinese reading may take a clue from the photos but, they aren't displayed if not logged in. The overclocking part sounds extremely interesting! Can anyone please upload the pictures somewhere and maybe some more information in English? I would appreciate! Anyone out there who has access to the pictures? Please? I would definitely try the overclocking and I'm sure that would give a lot more value for the X41. Okay, now that I see what the Chinese site is talking about, the wire may not actually be going to the R662 resistor. I've lifted up the plastic insulation under the DIMM socket on my X41T and there is what appears to be a test point pad on the board. It looks like the hack is to connect that point to system ground. 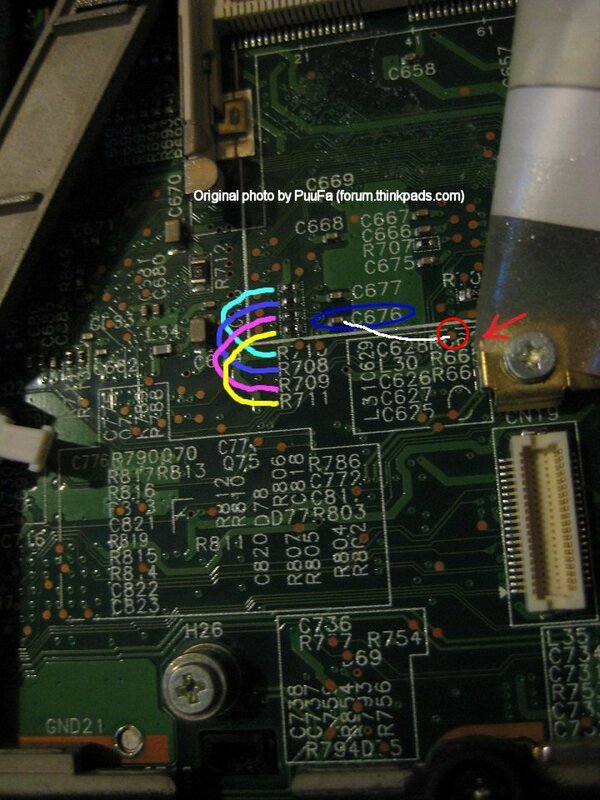 I've updated my photo by circling the test point in red and adding a white line showing where to connect the wire jumper. Edit: Perhaps another bios is needed? What bios was used? Someone had success on that? I fail registering the chinese site and cannot see their pics...they (due to googletrans) also connect to other resistors! Someone capable to register and/or chinese? Have you read the post above (http://forum.thinkpads.com/viewtopic.ph ... 31#p637031)? Yeah for sure...connected to two differents ground places. with connection to R676 pasa nada, normal boot @1.6Ghz. Connected to R674 systems hangs: two poss. 1. my cpu cannot go 2.13Ghz 2. it´s wrong! they are writing a lot on the chinese forum, maybe there needs to be more! One of the posts did say just to "spread" the soldering of C676 to the nearby ground plate, but then the author also said it didn't work for him possibly because of his CPU's limitation. I'll have to check the OC on my X41 tablet and let you know if that works or not. In the meantime I will tell you that the specs for the X41 state that it can use only 1.5 Gb of RAM but I 've found that you can actually push it to 2 Gb. Originally my X41 came with 512 so I got a 1 Gb stick DDR 667 and worked just fine but I had another 2 Gb stick from a Toshiba I do not use so decided to give it a try, swapped the stick and voilá it worked, XP and Win7 recognized it as 2 GB Max, I think the on board memory was disabled or ignored, did a burn test and no blue screens or memory related issues so far, so if you want to give it a try, do it. It is worth the extra 512. Let us know how your O/C experience goes. That might be a hint to the solution...maye if u put a 2gb 5300Mhz Ram, the internal slow 4200Mhz is switched off and the probality to run at 533Fsb is higher. 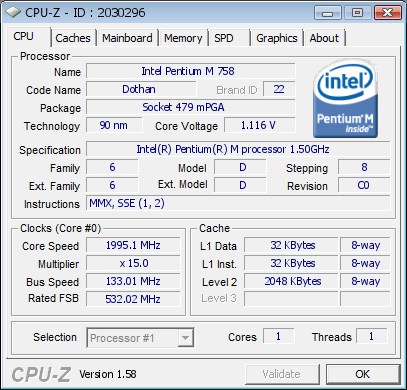 I doubt my Dothan running the 1.6Ghz @0.95V shall be unable to run 2.13@1.35V, but i have additional 1gb of 4200Mhz Ram. Got x41 non tablet, just brazed those two points like in a picture above and it worked. Watching youtube video @720p warmed cpu to 65 degrees celsius. I am having a normal PM725, whereas you have the Low Voltage Pentium M you were paying for. weird stuff ey? maybe thats the reason why it´s not working for me...I should have a PM778!!! Did someone know of that? My X41t has a replacement Mobo w/o S/N and a wrong CPU. I am confused! @Klimu can you please post your bios version? And did u make a shot of the mod? Got the latest bios from lenovo site - 2.09 and ECP 1.02. I didn't took any photos because the mod looks just like on that screen above in loyukfai post. I have used one naked thin wire from a headphones cable. Hi, is the speedstep disabled with this mod ? johnbob wrote: Hi, is the speedstep disabled with this mod ? Multiplier and vcore regulates according to power scheme. klimu wrote: Multiplier and vcore regulates according to power scheme. Do you have links to images for the page you note? On my X41 Tablet I'm considering the change to the native SATA interface. The CCFL is starting to dim and I would be pretty happy if I could figure out how to switch to a LED backlight system. Overclocking would be useful, except I'm concerned the extra heat would shorten the life of the CPU?? Do you know a source of the hacked BIOS? Which Mac power adapter are they using that is smaller than the current one? Changing the cable end seems like a pretty simple thing to do. Regarding the LED mod I believe there's a thread on thinkpads.com too. Try searching for it. I tried it on my 1.6 GHz X41 (non-Tablet) and it posted @ 2.13 GHz but was instable and locked up when doing something CPU intensive. Also tried it on one X41 Tablet (1.5 GHz) motherboard but that did not work, booted at its original 1.5 GHz speed. So far it seems to work only on non-tablets? @loyukfai LOL you are totally right, but I didn't know it by then. Newbie excitment I guess. @Thrakath I've used different sticks Samsung, Adata and Kingston, all of them work the same but I'm a little confused because CPU-Z reports the speed as 99.8 GHz Dual, only one stick displays data and Everest does the same. Doesn't you need to populate both banks to enable the dual channel? If so, how come Win 7 and Everest report the 2.5 Gb but you can't use the extra 512? I haven't had time to do the OC mod, I want to do the Sata mod first. Will keep you posted, gents. stormende wrote: I haven't had time to do the OC mod, I want to do the Sata mod first. I did a SATA mod on my X41 and using Toshiba 80GB 5400rpm 8MB cache 1.8" SATA drive gave W7 hard drive WEI 5.1. Not bad! I've got myself a new X41T motherboard. I'll give this a try once again. It would be a bit disappointing if it doesn't work on the tablet version, But that's what it appears to be above. O_o Odd! Update: It's immensely difficult getting the solder to stick to the second point! I tried about 3 times and failed. I dont want to try more for i'm afraid of damaging the motherboard.. But i've also noted something. C676 appears to be ground, and the pad inside of the R662 is providing 1.1 Volts when the computer is powered.. effectively causing a short. Is that supposed to happen? What is the type of cell that used in 19Ah X41t battery? Did somebody tried to replace them? X41t for sale with extra sleeve.